Whether you’re an auto aficionado or you just want to make sure you have reliable transportation, keeping your car in good running shape is always important. Unfortunately, it can also be stressful, time-consuming and very, very expensive. You know how it is … you hear a funny noise, and start to worry about what it could be. Next, you lie awake at night wondering if you can fix it yourself, and if not, how much it will cost to fix. And all of this is before you get to the really stressful point where you have to try to explain the problem to a mechanic! Your AAA understands. With more than 110 years of experience, we’ve seen, heard and been through it all. That’s why we’ve written this special guide, 30 AAA Car Care Projects to Do Yourself … and What to Tell your Mechanic if You Don’t Want to DIY. Download it now! From simple chores like cleaning your car seats, to changing a tire, to deciding when it will cost more to try to do it yourself than to take it to a repair shop, this guide covers it all. And there’s simply no substitute for advice from objective, experienced car care experts you can trust. With our decades of experience, you know the advice we give in this 0 guide can be trusted. And we’re giving it away free to make sure this valuable advice gets into as many hands as possible! • Enjoy stress-free ownership of your most valuable possession, next to your home! This guide comes from the car care experts at AAA and in the auto industry. It’s detailed, thorough and easy to understand. 302 AAA Car Care Projects to Do Yourself … and What to Tell your Mechanic if You Don’t Want to DIY belongs in every home where there are one or more vehicles in the garage or driveway. Every one of the car care tasks in this guide can be handled at home. On the other hand, if you just don’t have the time or the desire, the guide also includes tips on finding a reputable mechanic, and how to accurately communicate the problem and any concerns to the mechanic, which will save you plenty of time, stress and money. Confused about different types of motor oil? The guide makes it simple to understand. Worried about resale value because of stains in the car’s interior plastic? The solution is in the guide. With this guide in hand, you’ll have a cleaner, safer, more reliable car, whether you plan on keeping it for years or hope to trade it in next month. This free guide is designed to end confusion and help you feel in control of the maintenance of your car. It covers all the car care issues that you worry about most, and also some you never knew you should care about! For instance, did you know that you should usually use the fresh air cycle when your air conditioner is running? It might seem more logical to use the recirculation cycle, because that air is already refrigerated, but using the fresh air cycle reduces the potential for mold build-up in the AC system. And have you heard of a clay bar kit? Many people haven’t, but using it correctly, as outlined in the free guide, can remove dirt from your car’s exterior that even the most vigorous washing won’t budge. You’ll also learn how to maintain your spare tire (yes, the spare – most car owners never give it a second thought until it’s too late), make your windshield wipers last, wash your car properly, change a tire, remove scratches from the paint, quickly remove snow and ice, spot pothole damage and restore faded headlights. As you’ve seen, you’ll be able to maintain a spotless car inside and out after you read this guide (and refer back to it as often as needed!). But of course there’s more to your car than just its good looks, which is why the guide also includes plenty of tips for maintaining and repairing its functional features, too. We’ve got tricks for temporarily fixing a leaky sunroof while you wait for a professional repair – and avoiding the ugly damage that water can cause inside your car. You’ll learn how your car’s AC works, and how to diagnose a problem with it. We’ll show you how to clean your car battery – and know when it’s time to replace it, too. Got an electric car? We can help with that, too. Find out how they work and what you should be doing that’s different from maintenance for a gasoline-powered car. Need to jump that battery? (We know it happens to everyone sooner or later.) The steps for safely performing that emergency chore are all here. And what about those darn dashboard lights … have you ever ignored one and regretted it later? Yes, so have I. This guide tells you when to act immediately! By the time you’ve finished reading this guide, AAA will have you performing monthly safety checks for total peace of mind, checking those all-important fluids, and replacing critical parts when they’re needed. And remember, if worst comes to worst and you really just want a professional to handle it, this guide has tips for finding and communicating with mechanics! No more nerve-wracking trips to the shop that have you biting your nails before, during and after! So I hope you’ll take some good advice and download 30 AAA Car Care Projects to Do Yourself right now. Remember, it’s absolutely free, and while it will only take you a few minutes to read, it will make you a much savvier car owner once you do – or even if you simply skim it now and read details when you need them later! After all, you can’t get much more reliable advice than AAA car care guidance. We have no financial stake in how well you maintain your car – but because we’re AAA, we want to give you peace of mind and complete confidence every time you push that ignition button (or turn the key!). So whether you’re a longtime AAA member, or you’ve heard of us but never experienced the benefits of our expertise, you can take advantage of this offer right now – and be reading your AAA car care guide in moments! 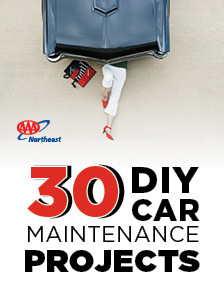 Get 30 AAA Car Care Projects to Do Yourself … and What to Tell your Mechanic if You Don’t Want to DIY right now, and save yourself time, money and stress! PS: Do you know which dashboard red lights are considered “the big 3”? These are the ones you absolutely must address when they light up. There’s also a fourth one that’s pretty important, too. And how should you respond to yellow or amber lights? Find out when you read the guide.